The term Big Data is a bit of a misnomer. 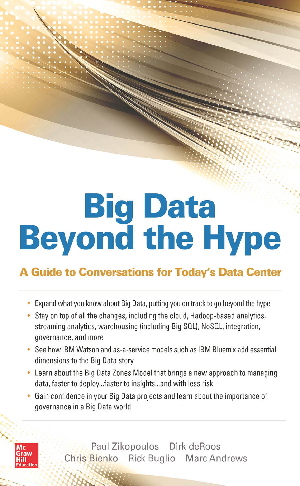 Truth be told, we’re not even big fans of the term—despite the fact that it is so prominently displayed on the cover of this book—because it implies that other data is somehow small (it might be) or that this particular type of data is large in size (it can be, but doesn’t have to be). This is Big Data in a nutshell: It is the ability to retain, process, and understand data like never before. It can mean more data than what you are using today; but it can also mean different kinds of data, a venture into the unstructured world where most of today’s data resides. In this book you will also learn how cognitive computing systems, like IBM Watson, fit into the Big Data world. Learn about the concept of data-in-motion and InfoSphere Streams, the world’s fastest and most flexible platform for streaming data. Capturing, storing, refining, transforming, governing, securing, and analyzing data are important topics also covered in this book.